Gnome Party Supplies Make Planning And Hosting A Kid's Gnome Themed Party Easy As Can Be! 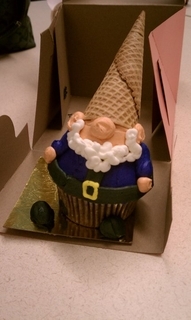 Here are some of the fun party supplies you can get for your Gnome themed party. They are bright and fun, everything party supplies should be. This is a picture of one of the party supply packs you can find and this also shows some of the party favor boxes with a Gnome theme. Look at the fun and easy to make cupcake decorating ideas below. I would make this gnome's jacket with red icing to match the wonderful gnome party supplies. What a big surprise these cupcakes would be for your party guests! Decorate your party room with a personalized party banner! Here's one that matches the party supplies on this page, just like them it also has a Gnome theme. It is becoming very popular to decorate with giant wall decals and if you want to host a Gnome party theme and you want wall decals, you are in luck. The decals come with the Gnome theme, so get ready to decorate with these easy to apply and easy to remove wall decals.